The two men’s soft banter contrasts with their rough manual labor. They call each other “habibi,” Arabic for “darling,” as they belt out commands amid the harsh clanging of the metal pipes crashing into the bed of an ancient truck. On its own, habibi has no romantic meaning for men, but I also hear them say “karim” back and forth, meaning “gentle” or “kind” one, never sure if it's another term of endearment or talk about the work. The heavy pipes need several men to lift them carefully so they do not fall onto the excited children who have gathered in this blackened, scrap strewn metal shop in Yatta, in Palestine’s West Bank. It’s an unusual scene beyond language. The center of attention is the activist Ezra Nawi. At 59 years old, he is a Mizrahi, or Arab, Jew, born to Iraqi immigrants. Ezra is also openly gay. He is in trouble with the law, but not on this side of the Barrier Wall. It’s the Israeli government and Army that have launched a campaign against him, hauling him and his Palestinian former lover, Fuad, through the Israeli legal system. Ezra’s homosexuality is one weapon used against him. 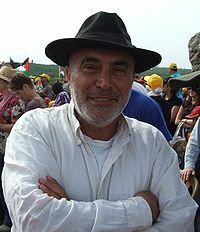 Ezra has most recently been accused of striking an Israeli policeman during a February 2007 Palestinian house demolition, recorded in the 2007 film Citizen Nawi by Nissim Mossek. As the house collapses, Ezra and the policeman run in. “In these eight seconds, when I am not seen by anyone, they say I assaulted the officer,” Ezra tells me. The incident created years of legal uncertainty for Ezra and is one of Israel’s most visible cases in the ongoing Palestinian conflict, ultimately landing Ezra in jail. Avichay Sharon, the legal assistant to Ezra’s lawyer, Lea Tsemel, explained it’s normal for cases to go on for years in Israel’s overburdened courts, especially those with “political contexts, political implications to them,” in which decisions are purposely delayed. But on this cold winter day, Ezra is unbothered. All day long, he has anticipated seeing Ali, the owner of the truck, a kaffiyeh headdress–covered Palestinian man with a sun-withered face. “Ali is a great guy. Actually I offer him to marriage,” Ezra tells me, smiling mischievously. Of course, I know this won’t come to pass, seeing as Ali is married with children. Ezra has the support of famous Jewish liberals like Naomi Klein, Noam Chomsky, and Neve Gordon, who in a joint letter called him “one of Israel's most courageous human rights activists.” Profiled in The New York Times, The Guardian, and Salon, Ezra has somehow escaped American gay media attention. Ezra is humble, working-class, a liberal gay version of Joe the Plumber, his occupation. It shows in the small Jerusalem apartment where I meet him before our day in the West Bank to see his latest project, a windmill generating electricity for a Palestinian refugee camp. That’s what the pipes are for. Dressed in loose khaki military-style clothes, Ezra is always smiling bashfully. With his expressive hand movements and worn-out hat, he reminds me of Zorba the Greek’s Anthony Quinn. He devilishly tells me he reminds most foreigners of Sean Connery. We spend the day driving Ezra’s dusty jeep, joined by Elad Orian, a 35-year-old Israeli engineer from COMET-ME, or Community, Energy and Technology in the Middle East, the group financing the windmill. Technically, it’s illegal for Jewish Israelis to enter the West Bank’s Hebron area. I worry more about how long it takes to get there, but as soon as I ask the question, Jerusalem still visible from the rear window, Ezra announces, “We’re already in the West Bank,” adding, “People don’t want to see their backyard. It’s very convenient to ignore it.” Israel, Gaza, and the West Bank combined are the size of New Jersey, only with a few million more people.